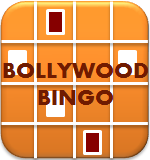 Enabling a Digital Life...: Bollywood Bingo! Contesting is in the air, especially after my earlier posts Piggy Bank of Ideas and 15 Minutes of Fame…Reloaded! I have been observing…oops listening to contests (and participating too…) on this radio station, 94.3FM Radio One (Bangalore) which won me a handful of goodies. On 14th May 2012, on the birthday of yesteryears Bollywood actress Waheeda Rehman, 94.3FM Radio One kicked off a new game show BOLLYWOOD BINGO anchored by MJ Pavithra. Sometime in late March/early April 2012, 94.3FM Radio One called out its listeners to be a part of Listener Audience Bureau (LAB). As mentioned by MJ Pavithra, the idea of Bollywood Bingo, a music based game show came from LAB. Haven’t I revealed it already? To recap, it’s BOLLYWOOD BINGO. One may also choose to call it MUSICAL TAMBOLA, BOLLYWOOD TAMBOLA or BOLLYWOOD HOUSIE. 14-5-2012, indicates that the ticket is valid for the show on 14th May 2012 and 18:33 is the time of issue of the ticket. Serial numbers 1, 2, 3…6 are the songs from Bollywood movies. Once you have the ticket, you are set for the game. You have to listen to 94.3FM Radio One and as soon as the song that’s mentioned in your ticket is played by MJ Pavithra, you mark off that song on your ticket. Once all the songs on the ticket have been played on-air, you win, or else you don’t. The show airs from 6:00 PM to 8:00 PM, Monday to Friday. The show started on 14th May 2012 and will be on up to 1st June 2012. Only those songs that are played between 6:00 PM to 8:00 PM are to be marked off on the ticket. If 5 songs mentioned on the ticket are aired between 6:00 PM to 8:00 PM and the sixth song is played at 8:05 PM, you won’t win. One concern that I had when I bought the ticket was, “gosh…I now have to be glued to the radio else I won’t know what songs have been played when I was not listening to it between 6:00 PM to 8:00 PM”. The good thing about the show is that in each commercial break MJ Pavithra gives a recap of all the songs that have been played before that break. To break the monotony, aided by her BINGO software that tells her how many songs have been played out from each ticket, she puts the listeners, who await just 3 or 2 more songs to completely mark off all the songs on the ticket, on air. One winner each day gets Gold Vouchers worth INR 2000/- redeemable at Abaran. I think it’s a good contest which increases time spent listening 94.3FM Radio One. For the sponsor, Abaran, it ensures that the store gets sampled by the listeners of Radio One when they go to redeem their vouchers. Abaran has been an advertiser on Radio One and vide this contest; the station generates tangible real time data (by way of number of SMSes received) to share with the sponsor. I would have appreciated if the station had put info on this segment on their website or social media, listing daily winners and songs played between 6:00 PM – 8:00 each day Monday to Friday from 14th May 2012 to 1st June 2012. This would relieve the listener to be stuck to a single station, but isn’t that the idea of the contest, increase time spent listening? The reason we don’t promote it on our website or social media is because I would beat my purpouse of building TSL (as guessed by you) if I was to put up the total list and their order on any other platform. The suspense lies in the fact that listeners don’t know whats coming next! And therefore ANYONE can win.